A guide for all the steps on VC 2.0, incase you are stuck on a step or just want to get it done. For this part, simply go to the computer and on the "Check for updates" tab, type the password 'Mother" in. Once you do that, you're done with 1.0. This was just the first step, however. Now you are able to crouch and pick up items, and you have acsess to a new room. You need to find 4 badges to progress, however. For this one, you need to find and put all the masks chronologically in order on the mask display upstairs. Part 9's mask is found underneath the fireplace in the main room, so just crouch and pick it up. 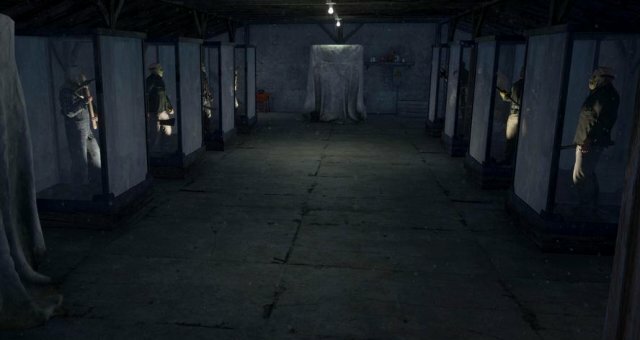 Part 7's mask is found upstairs in the room with the tent, next to the "COMING SOON" door. Crouch inside of the tent, and pick up Part 7's mask in the box. Part 3's mask is in the new room that was unlocked in a box near the table next to the table with the toy car on it. Once they're in order, pick up Part 5 Jason's mask. A sound will play and the drawer next to the masks will open up with a badge inside. Pick up the badge. You will hear Pamela Voorhees' voice over the phone, and the drawer opens with a badge. Pick up said badge. Chris is found in the bathroom Jenny is in, poking out of a box next to the shower. Police Badge - Unlocked Room, on the table with the toy car. Bandana - In the bathroom, on the toilet. Yo-Yo - In the tent room in the closet (beware for spiders). Hat - In the living room, next to the door. Bandana - Pear pedestal, in the unlocked room. Badge - Blue bird pedestal, in the upstairs tent room. Yo-Yo - Ducklings pedestal, in the upstairs weapons room. Hat - Red birds pedestal, in the room with the shoes next to the door. Do all these, and a badge will pop out of the hat pedestal. Pick it up. Now that you got your badges, head to the kitchen and place them on the board on the wall opposite of Deborah. The entrance to the Jason room will open up. Enter it, and head to the ringing phone and pick it up. You completed the Virtual Cabin!... not really. It's time for New Game +, baby. Welcome to New Game +. Before you do anything, head to the computer and set it to June 13, 1979. You change the date by hovering over a number and scrolling down on your mouse wheel. Once you do that, head to the Jason room, and answer the phone in there. The lights will go out, and now everyone in the cabin dies cause Part 3 Jason broke out of his display case. You need to see every corpse in order to leave. After you seen everyone's mutilated bodies, Jason busts through the door and you can finally leave the cabin. But wait! There's more!... Badges to collect. Only 3 this time, however. Oh yeah, Kenny has keys around his neck. Before you leave, be sure to enter the room Tiffany and Kenny were in, and close the door behind you to get the keys. Once you exit, be sure to head to your right and unlock the shed to get the shovel. You'll need the shovel. Once you reach the dirt pile, dig it up and you will see the delightful corpse of a dog. And a badge. Grab the badge. Next to the 2 seater outside is an old fridge, locked with a padlock. The padlock is "5312". Open it up, and you'll see Pamela's rotten head inside. Pick it up(cause why not), and take it to the shack on the hill next to the cementary. Once you put her down, a rock will flip over revealing a badge. Grab it n' leave. The most simple badge. Head to the cementary, and you'll see Jason's grave. Dig it up Tommy-style, and open up the coffin to see Jason, covered in maggots. Then, head to the right side of the fence and pick up a loose pole. Then, Tommy-style, stab it into him. He, of course, gets ressurected and kills you. Once you fade back in, grab the badge in his coffin and you're done. Head to the beach and put all the badges on the display case with the gas, and pick it up. Head to the boat, pour it in and sail away. Also, beware of swamp children in the lake. And you're done with New Game +! Guess what? New Game ++. Let's go. This is it. The finale. This is the hardest step in all of this. You need to input the famous Konami Code. For PC, you need to press the arrow keys to do the Up Up, Down Down, Left Right-Left Right part of the step, and you need to click your right mouse button then your left mouse button. Do this quickly and it won't work. You will then open the debug menu. Deactivate the collision setting, and head to the room you unlocked all the way back in 1.1. In the room, you will notice that the red door is glitching out. Walk into it. You will then enter an untextured bloody room. If you listen to the radio, Jason comes into the room the developer is in and kill them. A glitched badge will appear, so pick it up. You will fall through the floor, as your ears will get ♥♥♥ by the loud music, so turn down your audio beforehand. The game glitches out, and the cabin will reload. You will start out in the tent room. Follow the trail of glitched badges to downstairs, where suddenly Chuck from Illfonic will get thrown through the window. Interact with his corpse, and follow the badges again. 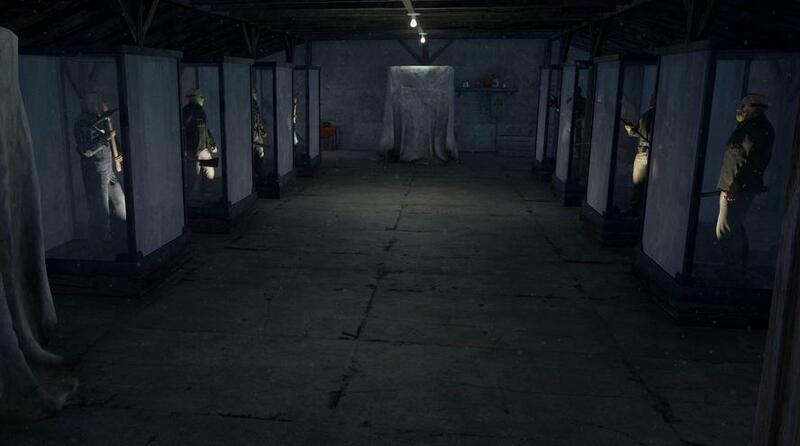 In the Jason room, all display cases will be broken, but some Jasons will be holding badges in their hands. Borrow the badges, and the last one will kill you after you grab his badge. All the cases are empty, and there is a new trail of badges. Follow them to upstairs, to the "COMING SOON" door. Once you do that, you will experience the amazing ending of VC 2.0. Now you are finally done with VC 2.0. Congratulations!